Millennials differ from older generations in many ways, from their racial and ethnic diversity to their distinctive views on a number of political and social issues. But they are similar in one surprising respect: As America’s youngest adult generation they are the least confident about the nation’s future, just like Generation Xers and Baby Boomers when they were young. In a survey of attitudes about government conducted last fall, just 37% of Millennials said they had “quite a lot of confidence” in the future of the United States, compared with 45% of Gen Xers, 49% of Boomers and 56% of the Silent Generation. Two decades ago, Gen Xers, then in their teens and 20s, stood out for their lack of confidence in the nation’s future. In 1994, just 30% of Gen Xers said they had quite a lot of confidence in the future of the U.S. 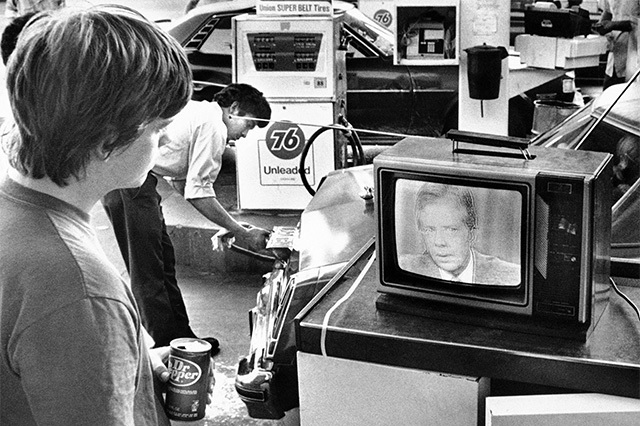 Among older generations at the time – Boomers and Silents – half or more had a lot of confidence in the nation’s future. And two decades before that, Boomers were less bullish than their elders in assessing the nation’s future. 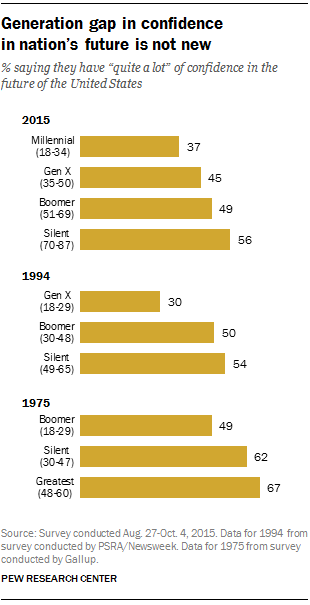 In 1975, when Boomers were the youngest generation, 49% had a great deal of confidence in the future of the U.S., compared with 62% of Silents and 67% of the Greatest Generation. Notably, on a different measure of expectations for the nation – one that compares the past to the future – Millennials are more optimistic than are older generations. In 2014, 49% of Millennials said the country’s best years were “ahead of us,” while 45% said they were “behind us.” Among older generations, somewhat more said the United States’ best years were behind than ahead. That question had not been asked previously, so it is not possible to determine if these views have changed over time. Samantha Smith is a former research assistant at Pew Research Center.